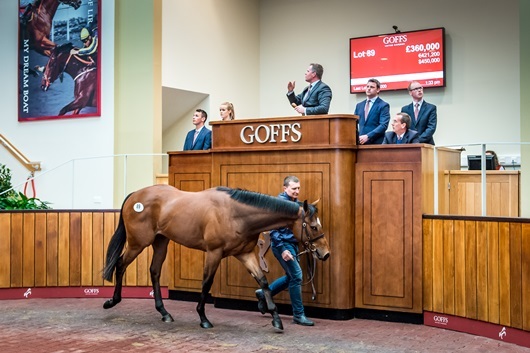 (Report - 12 April 2017) A meteoric rise in figures on last year’s sale told only part of the success story that was today’s Goffs UK Breeze Up Sale at Doncaster as the sale smashed 2015’s record sale in every measure including a new record top price breezer of £360,000 and a clearance rate of 90%. Coming off the back of a superb Royal Ascot where the sale enjoyed four winners – two at Group 1 level – buyers from around the world flocked to Doncaster today and drove the average up 37% on last year’s sale, and more importantly up 16% on 2015’s record sale, to £45,025. A total of 12 horses made over £100,000, up from nine in 2015’s record sale. One of three lots to exceed £200,000 today was Tally-Ho Stud’s Kodiac colt (Lot 89 - pictured) which sold to Richard O'Gorman for £360,000 – a new record top price for the sale. Fairgreen Stables’ Lonhro colt (Lot 62) made £210,000 to the bid of Blandford Bloodstock while Kerri Radcliffe went to £200,000 to secure Gaybrook Lodge Stud’s More Than Ready colt (lot 92) for £200,000. The colt who was purchased for just $5,000 was owned by Jim and Louise McCartan’s children Anna and Philip, aged 12 and 10. The Sale saw buyers from 12 countries on the buyer’s sheet; America, Australia, Bahrain, Denmark, Dubai, Hong Kong, Italy, Kuwait, Norway, Qatar, Spain and Sweden. “Today has been an amazing experience for the entire team at Goffs UK and indeed our consignors who supported us. The sale had its best ever year on the track in 2016, with the highlight being the Royal Ascot meeting, and this year’s sale has undoubtedly been the best Breeze Up Sale conducted here at Goffs.